Out of process extensions is now on in Nightly for Windows users. Much excite about this. Please file any bugs you might find with this, we’ve been squashing a bunch down the last week. 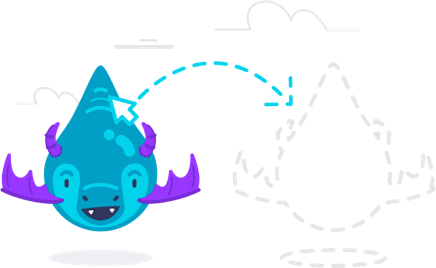 The new Storage API is now available in Nightly and ready for testing! If you’re a web developer, give it a shot! The refined v2 organization of about:preferences has landed and should appear in Nightly builds very soon. This second re-org should ship in Firefox 56. Evelyn made it so that we now speculatively connect to autocompleted hostnames in the awesomebar. Activity Stream has been enabled by default in Nightly! Check it out and file bugs! Build for comfort and for speed! We now color the Windows 10 title bar with the Windows accent color. Context menu sub items can now have their own icons thanks to Swapnesh. Moz-extension URLs are now supported in the webRequest API. browsingData API can now remove cookies by hostname. Print preview can now be accessed from a WebExtension API. Thanks to dw-dev! We have a sample of top crashers (by signature) from FF53 release crash pings (not reports), for 5/19-5/25, broken down by process type. Some interesting things there, sent to the stability@ list for further investigation. Updates to 64-bit begin in FF56 (stub installer introduced this in FF55). About to land: LZMA compression and SHA384 support for update downloads for FF56, reducing the size of the download and improving its security. [Form Autofill] Make Phishing Warning consistent no matter hovering on items or not. We’re working hard to ship Android Activity Stream in Firefox for Android 57! We’ve got a working draft of an open-source Android library that will allow you to log into your Firefox Sync account and download your bookmarks, history, and passwords. Check it out here. We are working on some UI refresh in Firefox for Android 57 to align the Firefox Desktop! Follow along in this bug. We are also planning to phase out the support of Android 4.0 (API 15). Hoping to do this in Fennec 56. Here’s the tracking bug. Gathering profiles from automation for Talos is broken for many tests. I have patches waiting for review in this bug should fix that. Working on making the tab strip animate using smooth-scroll instead of requestAnimationFrame + scrollLeft / scrollRight. Removed most remaining Promise.jsm uses in the browser code, and it’s now blacklisted before first paint. browser_startup_images.js catching images loaded before first paint but not displayed. Delayed things that were running off final-ui-startup in nsBrowserGlue.js for no good reason. Working on lazy loading lots of scripts currently loaded by browser.xul before first paint. sessionstore.js is now saved in compressed format as sessionstore.jsonlz4 to save your hard drive perf and should save some I/O cycles. Built the prototype for adding the ability for the user to pin frequently-used items from the Page Action menu into the URL bar. This work adds a context menu to items in the action menu to control this. The prototype also added Page Action menu entries for Pocket and Screenshots (and as a next step, their existing buttons in the navbar will be removed). Eventually there will be an WebExtensions API so that Addons can extend this menu (but that work may not make 57). The bookmark star has moved into the URL bar. This (as with Pocket and Screenshots, mentioned above) is part of our work to consolidate actions you perform with the page into the Page Action menu. The sidebar button is now in the toolbar by default. This gives easy one-click access to toggle the sidebar. The Library panel will now show Bookmarks and Downloads. (Bookmarks are already in Nightly, Downloads was built during the week but needs more work before landing). Pin to Overflow animation landed, try it now! Right-click on a toolbarbutton and use “Pin to Overflow Menu” to see the awesome animation! The Stop/Reload animation landed also! We’ve got great feedback about speeding it up and making it less distracting, will be working on that soon. The Save to Pocket animation is going through review and should land soon. Once this lands, we should get the Bookmark animation quickly since they will be similar implementations. New arrow-panel animations are being worked on. Working through test failures right now. Johann is working on resizing context menus and other menus when accessed through touch. Dale updated the toolbar background colors on Mac and Windows. The tour notification is now implemented with a timing policy: we mute it after the 1st 5mins and each tour only has 2 chances to prompt with notification. Each chance includes 8 impressions and 5-days life time. Now UITour is able to highlight the single search bar with dropdown displayed, which will be used for v57 Address Bar tour later. Soon the search box will float above the preferences while scrolling the page. This work is in progress. Going to be using a build-time switch for the Firefox 57 visual refresh work so QA can test the Firefox 56 reorganization using the actual builds we will be shipping. The Follow On Search Count addon was shipped to 54 population. Various fixes to one-off buttons placement on hidpi screens. Discussed an experimentation plan to change the awesomebar results mixup in preparation for the search bar unification. The awesomebar results mixup can now be changed through pref-based Shield Studies. The Places database connection is now initialized lazily on first request, rather than when any of the Places services is instantiated. Async Places transactions (Jank-free bookmarking UI) will be enabled in Nightly in the next days. Lots of fixes landed during the San Francisco All Hands and the week after it. Thanks to this work we are very close to Milestone 1 of synchronous bookmarks API removal, the edit bookmark panel now uses the new asynchronous API. More code is about to be converted. Lots of intermittent test failures became more frequent with sync to async changes and therefore could be fixed. Places is no more crashing in case of an unrecoverable db corruption, instead it sends telemetry. It is also no more running ANALYZE on a timer (Thanks to Mayank), instead it uses the new “PRAGMA optimize” on shutdown. Fixed a recent spike in async shutdown crashes due to Sqlite.jsm misuse from Activity Stream and Kinto-based blocklists. Restriction tokens in the Location Bar cannot be modified through prefs anymore. We are discussing plans to make them more coherent and useful (like using “?” to restrict to search and suggestions). Removed most of the nested loops in the Sync code. We hope it will make profiling easier without Sync polluting stacktraces. links to the previous meeting notes, instead of the newest ones. Here are the newest ones. Thank you for the issue. It is nice to read it. Keep going 🙂 Firefox is becoming faster than ever with these all changes. I can’t remember when Nightly was slow last time. Thumbs up. the flexible space is not flexible at all (it has a fixed width). Is there already a bug filed to make it flexible where I can follow the progress? 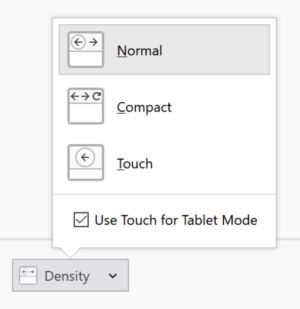 And why does the touch density option does not exist on macOS? There *are* touch display tablets which are compatible with macOS so there is really no reason not to offer this option to users of macOS. > the flexible space is not flexible at all (it has a fixed width). Is there already a bug filed to make it flexible where I can follow the progress? I don’t think there is a bug, but I thought the flexible space is called “flexible” not because you can stretch it but because it resizes based on the number of items in the toolbar. You can drag multiple flexible spaces into the toolbar. Feel free to open a bug to get in touch with the folks that implemented it. 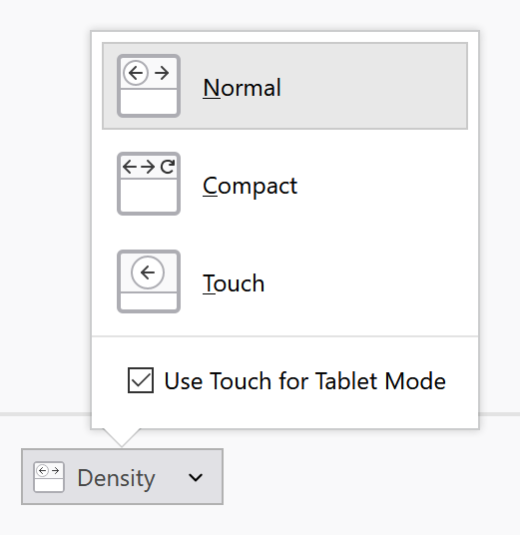 > And why does the touch density option does not exist on macOS? There *are* touch display tablets which are compatible with macOS so there is really no reason not to offer this option to users of macOS. So far I don’t think anyone was aware that there is any kind of touch support on Mac. Again, feel free to make a bug and we’ll take the proposal seriously. One one hand, it’s cheap to just enable the option, on the other hand it might confuse (you will admit) the vast majority of Mac users that don’t have a touch screen. This is still happening and I tried to reinstall Firefox Nightly. But reinstalling Firefox Nightly did not help fix the problem. The problem still persists. I have windows 10 creators update still can’t update my Firefox Nightly 64 bit 2017-04-18-03-02-20-mozilla-central.zip 64bit for desktop to the latest update and or any update past Firefox Nightly 64 bit 2017-04-18-03-02-20-mozilla-central.zip Of Firefox Nightly 64bit for desktop. Because when I do it will only show up on windows 10 creators update safe mode desktop. In normal mode where any update pasted update 2017-04-18-03-02-20-mozilla-central.zip 64bit and the lasted update of Firefox Nightly 64bit for desktop will not show up on the normal desktop it will only show up as background processes. And it keep not showing up on the normal desktop every time and not just once.